Steel Trendz Portable Buildings provide custom designed portable buildings including site offices and sheds. 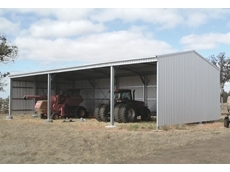 A&M Garages And Sheds provide garages, farm sheds, barns and carports. Shed Erector provide reliable shed erecting services, with years of experience in commercial and residential shed building. Stokland Sheds specialises in the design and construction of Pre Fabricated Steel Buildings. Stokland Sheds’ staff have the knowledge to assist you with all aspects of your new shedding requirements, with over five years experience in the shed industry.